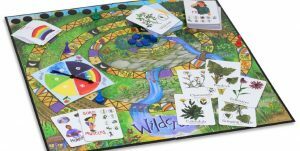 Similar to Candyland or Chutes and Ladders, Wildcraft takes players down a winding path to grandmother’s house. There are waterfalls to slide down, logs to cross and deer trails to wander down, along the way. Players encounter all kinds of troubles on the way — such as mosquito bites and bee stings — which require them to identify the proper herbal medicine — stinging nettle and plantain. 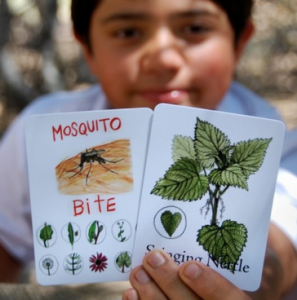 Wildcraft teaches children to identify 25 important edible and medicinal plants and their uses, mostly in first aid situations. It takes them through several ecosystems as they climb the mountain. It also teaches team work. The only way to make it to the huckleberry patch and back to Grandma’s by nightfall is by helping each other out. The game is good for children of all ages, even those who can’t read. 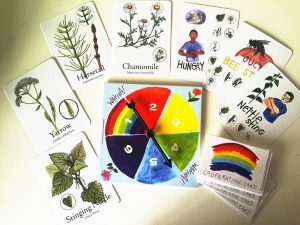 The beautifully illustrated game board and box are made of 100% recycled wood chips and are 100% re-recyclable. They are also printed with eco-friendly vegetable-based ink. What a great idea for a kids’ game. We need one in Australia! Except we’d have to have one for the north (tropics), one for the desert/arid lands (around central Australia), and one or two for eastern and western southern Australia; not to mention Tasmania. But where can I buy it? On Amazon… there are several links throughout the story.